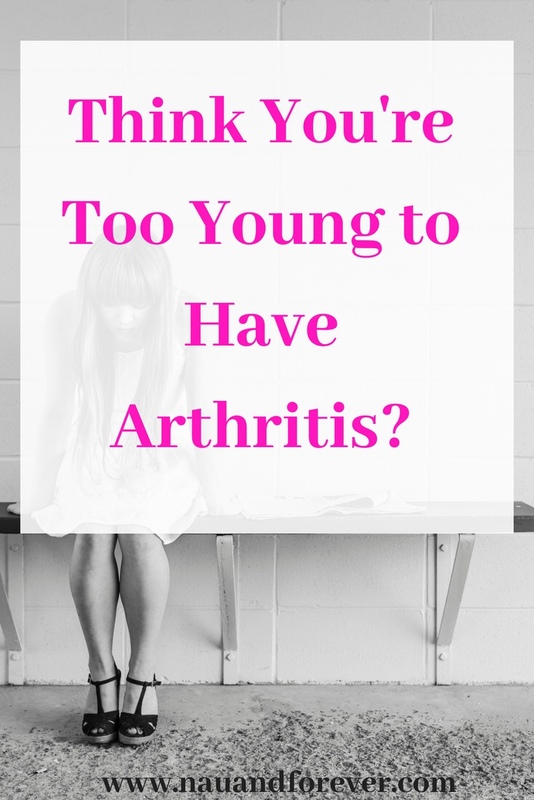 Think You’re Too Young To Have Arthritis? When I think of arthritis, I automatically think of my grandparents. They had terrible arthritis. I thought it was an “old person” condition. I’m too young for arthritis. When I was 18, I broke my arm and had a metal plate put in. I was told that I would probably get arthritis and it would probably happen sooner rather than later. (**eye roll**) There was so much about arthritis that I didn’t understand. It isn’t just a condition that affects old folks. If you suffer from arthritis then you will understand what a debilitating condition it is. Arthritis can affect your nodules, lumps of tissue under the skin. You may find that this happens over the bonier areas of the body, such as fingers or even elbows. You may also break out in rashes, and experience bone thinning. This is the result of chronic inflammation, and it can cause you to break bones much more easily than you normally would. Of course, arthritis can affect you at any age, whether you’re in your 20’s, 30’s or 40’s, so it helps to be aware of the signs so you can get it treated as soon as possible. Chronic inflammation can lead to loss of bone density and you may even find that your joints are much more sensitive than they would normally be. If you want to try and help your own arthritis then one thing that you can do is try and get a lot of exercise. You also need to make sure that you have a very high calcium diet as well, as this will help you to strengthen your bones. Vitamin D is also great, so get out in the sun as much as possible. If you happen to experience bone loss, then your doctor may be able to prescribe something that can stimulate this. You can also check outDrive medical equipment to see if they can help you. Some people who suffer from arthritis also experience problems with their eyes. The whites of the eyes inflame and this can lead to scarring. Symptoms of this include blurred vision, redness, pain and more. Your doctor will be able to help you to treat this, but concentration exercises are great and the more you can strengthen your eyes at this point, the better. Arthritis can affect many different parts of the body, but a lot of people don’t know that it can affect the mouth as well. Inflammation can actually damage the glands in the mouth that help to produce moisture. You may find that your mouth is constantly dry, and there are tons of things that you can do to help yourself with this. Good dentalhygiene is essential here, because if you have a dry mouth then bacteria will flourish. You can also have regular drinking intervals, and avoid alcohol wherever possible. Did you know that nearly 80% of people who suffer from arthritis also have some degree of lung inflammation? Most of the time this isn’t bad enough to produce any symptoms but you may end up with pulmonary fibrosis if you do notice symptoms but don’t get it treated. Being active is crucial here and keeping your lungs in goodhealth will go a long way. You’re not too young for arthritis. If you do struggle with it then consider going on an exercise bike or even a rowing machine, as you can jump off at any time and you don’t have to worry about the journey back home if your knees, elbows or back starts to get bad.